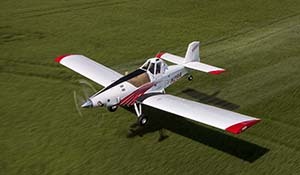 Thrush Aircraft, a small business based in Albany, Ga., exports aerial-application aircraft used in agriculture, forestry, and firefighting operations. Founded in 2003, the company’s aircrafts are relied on for their role in helping operations of all sizes fertilize crops, control insects, eliminate weeds and fight fires. Whether it be increasing yields, saving lives, or preventing the loss of property or forest, it’s something we don’t take lightly. After learning of EXIM Bank from the U.S. Commercial Service in Savannah, Ga., Thrush first took advantage of the Bank's products in 2010 to export an aircraft to Kenya. Since then, Thrush's production has doubled from 30 aircraft a year to 60 aircraft, and the company has added 60 new jobs to its rolls. Thrush Aircraft is sustaining 100 American jobs, thanks to EXIM Bank’s support of its aircraft exports. During 2016, EXIM’s working capital guarantee supported Thrush’s exports to Ecuador, Brazil, Guatemala, Canada and the Philippines. Additionally, EXIM’s medium-term insurance supported Thrush’s exports to Brazil through co-financing with two other export credit agencies (ECAs): EGAP of the Czech Republic and Export Development Canada (EDC). Today there are more than 2,200 Thrush aircraft operating in some 80 countries around the world. More than 60 percent of the company's sales are international, and it credits its expansion in Brazil, which expects to see a spike in sales from $4.3 million to $17 million, to EXIM Bank support. The company has grown immensely to 280 employees. EXIM has supported $91.3 million of its exports between 2014 and 2018. "EXIM is an extremely bright and highly capable banking team bringing their expertise to bear on a commercial opportunity that helps - not only Thrush Aircraft and our jobs - but our new customers in China as well. I'm not exaggerating when I say this deal simply would not have been possible without EXIM banking behind it."